Pan Am was, by far, my favorite new show of the past year. Sadly, I was one of very few who felt this way and it was axed after only one season. Still, it is available on the ABC website, iTunes, and probably coming to a Netflix queue near you sometime soon. Set in 1963, this 14 episode series follows the crew of the new Clipper Majestic, the largest plane in the Pan Am fleet piloted by one Dean Lowrey, newly promoted and the youngest pilot in Pan Am's employ. His copilot and long-time friend, Ted, is a former Naval pilot and just a teensy bit jealous of Dean's promotion. Then there's Maggie, the trouble making purser, and Colette, the charming Frenchwoman who always falls for the wrong guy way too fast. Most of the series, however, tends to revolve around the sisters Kate and Laura Cameron. Kate became a stewardess to gain independence from her controlling, overprotective mother. Laura did much the same...after running away from her own wedding. Really, what girl wouldn't need to get out of the country after something like that? Most of my flight experience is post 9-11. I remember meeting someone at the gate once; I don't recall ever being able to skip the metal detectors, and twice I've been flagged by security because of what I was wearing (the first time, I was thirteen, it was 6 am, and apparently tired teenage girls in pink hoodies and ball caps are threatening. The second time, it was for wearing a long skirt. No, I'm not joking). So for me, a big part of the draw to this series was that it depicts an era when traveling was more pleasurable, and assumptions weren't made about passengers before they even checked in. It shows a time when airlines actually cared about pleasing their customers rather than just squeezing every penny possible out of them. And then, there are the cute little uniforms. 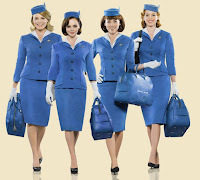 Now after my last post, I'm sure someone out there is expecting me to go into some big feminist rant at this point, what with the use of "stewardess" instead of "flight attendant", the weigh-ins the girls have to go through before they get on the planes, the way there are no women in power in the series, etc. But I'm not. You see, my problem with Grease is that most of the anti-female commentary (ahem. "Beauty School Drop Out") were creative decisions, rather than strictly historical ones. It would be one thing if, for example, one of the T-Birds or even a teacher had told Frenchy she couldn't become a beautician, or if her parents had forbid it and forced her to go back to school. Instead, they made her "inner voice" a misogynistic jerk and allowed her to give up without trying. Meanwhile, in Pan Am, every single one of these girls is a fighter in her own way. The weigh-ins, age limits, discrimination against women in the work place, and sexual harassment depicted in the show are all accurate. 4. a person who attends to the domestic concerns of persons on board a vessel, as in overseeing maids and waiters. 5. an employee on a ship, train, or bus who waits on and is responsible for the comfort of passengers, takes orders for or distributes food, etc." French, Spanish, German, and Japanese (to name a few) all have masculine and feminine nouns, verbs, and adjectives. It's just a language construct. Perhaps at one time it was meant to lower the status of women in comparison to men, but that is not the case anymore. Stewardess is the female and I find it no more offensive than saying actress, princess, or even queen. They're too sides of a coin, and both are shaped equally even if they're painted a little differently. Anyway. As I was saying. The cute little uniforms. Seeing as they required the use of a girdle, I doubt the trademark blue suits were comfortable, or that it was practical to spend so many hours in heels, but it certainly does make a lovely picture. One of my favorite things about the uniform is the hat. I just love hats with hat pins, I don't know why. I also want one of those bags for a reason I cannot explain. Normally I am opposed to anything with advertising on it, but in general I just love the shape (I have two purses that are smaller versions). For me, Kate is the style icon of the series. True, this is probably intentional on the part of the creators/producers/costume department, since she is the main character, but it's still true. It doesn't hurt that she reminds me a great deal of a friend. Kate is always elegant, from the tips of her shoes (which always match her bag) to the top of her updo (which I want to learn how to recreate). Her sister, Laura, is generally a bit more casual, likely Maggie's influence since the two are very close. Still, she has impeccable taste. Of course, you can put Christina Ricci in just about anything and I'll watch it. She's been one of my favorite actresses since I was a kid and I was thrilled to see her in this series. It doesn't hurt my opinion that she's Pan Am's Rizzo, and by now you probably all know that I love the strong female roles. Colette's style is much less flashy, but no one dresses better for an event, don't you agree? Funny story: There's a game I like to play when watching shows or movies with Canadian cast members. It's called, spot the Quebecois. While I learned European French in high school, my mother's family speaks Canadian French, which is a little different. While I don't speak the language well myself, I'm pretty good at picking out what continent the speaker is from based on dialect and accent (and I'm pretty good at telling the difference between American, Canadian, and French Canadian just by how they speak English). Karine Vanasse is very good at mimicking the European dialect--so much so that I suspected she was a French native, or at least had a VERY good dialogue coach. Then I heard her speak Italian, and realized she was actually from Quebec. I find this hilarious, since my Italian teacher in Florence kept accusing me of speaking Italian with a French accent. It's funny the way our voices and pronunciation change (or don't!) depending on the language we're speaking.